Georges St-Pierre is back, but he probably should’ve just stayed home. 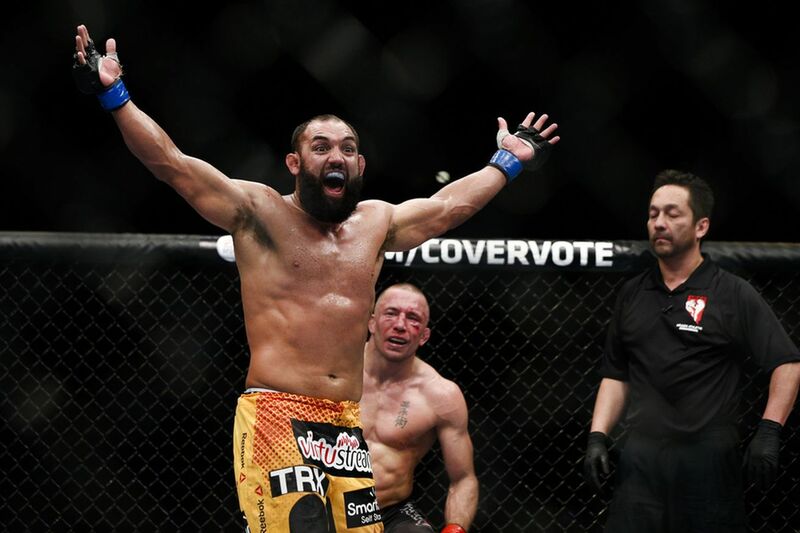 That’s according to Johny Hendricks, who declared on The MMA Hour that the former Ultimate Fighting Championship (UFC) welterweight champion of the world should’ve stayed out of the fight game after being gone for over three years. Indeed, “Bigg Rigg” made it known shortly after his win over Hector Lombard at UFC Fight Night 105 a few weeks ago that he was interested in punching “GSP” in the face at 185 pounds in order to get some revenge for losing a split decision to the French-Canadian star at UFC 167 back in 2013. For Hendricks, though he knows the type of athlete “Rush” is, the extended time off may be too much for him to overcome, saying he doesn’t feel St-Pierre could’ve done enough to keep up with the ever-evolving sport. The difference between St-Pierre’s and Johny’s “rough periods,” though, are quite dramatic. For one, Georges was at the top of the fight game at the time of his departure and hadn’t lost a fight in nearly six years, only walking away to deal with personal issues. “Bigg Rigg,” meanwhile, was on a three-fight skid before abandoning the welterweight division for the heavier 185-pound weight class. That said, most would assume Georges doesn’t necessarily need to change his style of fighting or gameplan in order to succeed, as he wasn’t in a funk and what he we doing before seemed to be working perfectly. A sentiment Hendricks doesn’t share. “Time changes, it always does. One day, the time is going to change where I am not going to be able to compete with these guys anymore. It’s just the way that it is. Once I showed how to defeat Georges St-Pierre, I think people are going to start using that gameplan and it’s going to be harder on him,” added the ex-170-pound king, who is still adamant he deserved the nod at UFC 167 in what was St-Pierre’s last bout with the promotion. Furthermore, Johny points to a couple of other former UFC champions who couldn’t walk away from the fight game at the right time, opting to stay in a bit too long for his taste. After over three years away from the sport, it will be interesting to see whether or not “Rush” still has what it takes to compete against the the best-of-the-best or if he should have followed Johny’s advice. And he could be in for a “tough” challenge for his first fight back.